This recipe for slow cooker mac and cheese is rich and creamy with only 15 minutes of prep time. 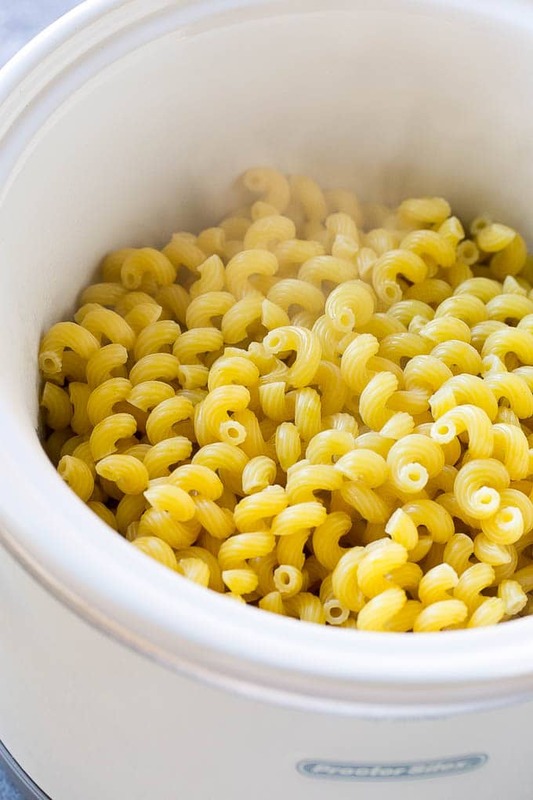 It’s the easiest crock pot macaroni and cheese ever! This macaroni and cheese is total perfection, my kids absolutely adore it and ask for it every week. It’s perfect for a holiday meal side dish or as an easy weeknight dinner. I’ve found that homemade mac and cheese can be a little tricky to get right. Sometimes I have issues with the sauce separating or being grainy from the flour, and I find that baked versions of mac and cheese can dry out easily. This slow cooker mac and cheese is practically fool proof; it comes out ultra creamy every time thanks to a secret ingredient. 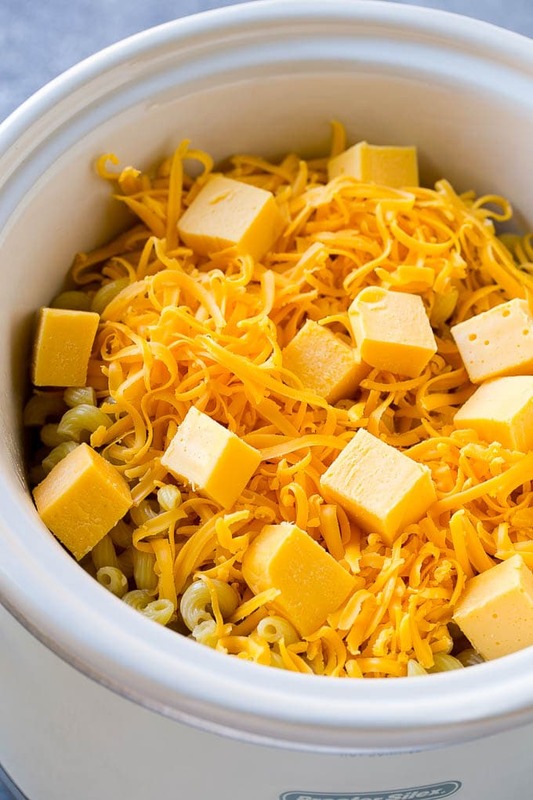 This crock pot mac and cheese is very simple to make. First step is to boil you noodles. Slow cooker mac and cheese can sometimes come out with mushy, overcooked pasta if it cooks for too long. To avoid that, I use a heartier noodle like cavatappi, and I undercook it by 2 minutes before I put it into the slow cooker. In about 2 hours you’ll have mac and cheese perfection! The cook time for this mac and cheese varies a bit depending on your slow cooker. I find that some of the older slow cookers tend to run on the hot side and have less heat settings. 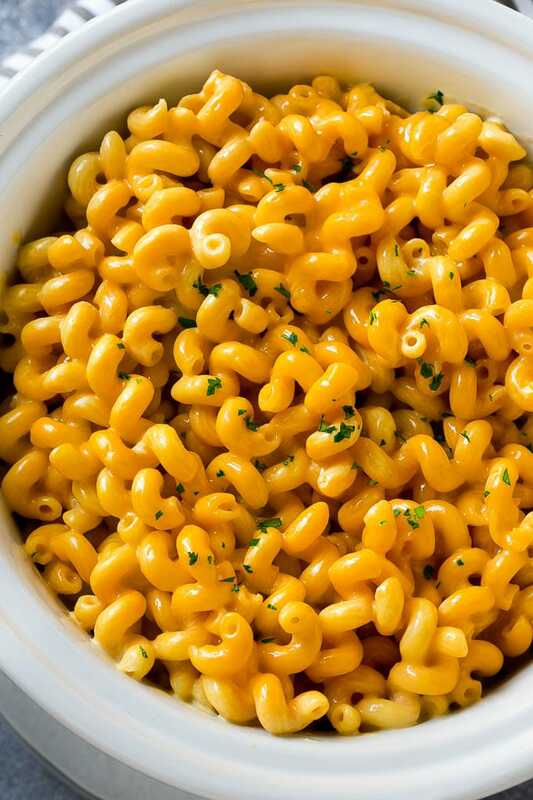 If you’ve got an older crock pot, cook this mac and cheese for about 1 1/2 hours to avoid mushy noodles. If you’ve got a more modern crock pot with multiple heat settings, cook on the lowest setting for 2 hours. Either way you’ll want to stir the mac a few times during the cooking process. IF it looks soupy at the end of the cook time, just keep stirring and it will come together into a smooth sauce. And now for the secret ingredient reveal: American cheese! Not the kind that comes in the little slices wrapped in plastic; go to your deli and buy a block of American cheese to cut into cubes for this recipe. This cheese melts beautifully and makes the end result ultra creamy. The American cheese, combined with cheddar cheese, butter, half and half and evaporated milk, make the sauce perfectly smooth. This is a basic mac and cheese in terms of the seasoning profile, but you can amp it up with the addition of your favorite herbs and spices, or even add some cubed ham at the end of the cook time for an extra special treat! This slow cooker mac and cheese recipe is rich and creamy and super easy to make! Cook the pasta in boiling water for 2 minutes less than package directions call for. Coat a 4 or 6 quart slow cooker with cooking spray. Place the noodles in the slow cooker and add the butter. Stir until the noodles are coated with butter. Add the evaporated milk, half and half, cheddar cheese, american cheese, salt, pepper, onion powder and paprika. Cover and cook on LOW for 1 1/2 - 2 hours. Stir every 30 minutes. At the end of the cook time, stir until a smooth sauce coats the noodles. Serve, topped with parsley if desired. 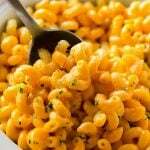 Cavatappi is sometimes called corkscrew pasta or cellentani. If you can't find cavatappi you can use farfalle or gemelli. This post was originally published on April 10, 2017 and was updated on December 14, 2017 with a new and improved recipe and photos. How big of a crockpot/slow cooker would I need to double this recipe? And would there be any additional cook time? I’d use a 6 or 7 quart slow cooker, cook time should be the same! I served it for my Bunco group with tons of topping choices just like a sundae bar! It was a real hit! Easy for me as it was all done ahead of time. My topping were onions, salsa, bacon crispy, olives, salsa, more grated cheese, chopped tomatoes and sour cream! Hi there! I am not seeing how many people this recipe serves?? Can this recipe be made without pre-cooking the pasta? I have read several others that say they work well either way. You can put the pasta in uncooked but it gets pretty mushy and thick if you do it that way. I had originally written the recipe that way, then re-tested and changed the recipe because the texture is so much better with pre-cooked pasta. If you prefer to use uncooked pasta you’ll want to add more liquid! Is the cooking for 2 minutes less than package directions for the al dente time, or tho longer time on the box? 2 minutes less than you would normally cook it. So for me, if it says 8-10 minutes I typically cook right in the middle at 9 minutes. I subtract 2 minutes from that and cook for 7 minutes instead. This Mac and Cheese turned out so great! Received many compliments. Followed instructions to the letter, had to turn up my older 4qt. crock to high for the final hour. Next to the crock, I set out custard cups filled with bacon bits, Rotel, bread crumbs(crushed croutons) and chopped green onions. This is a keeper! Thank You! Love the idea of adding the toppings, thanks for reporting back! Excited to try this! Salted or unsalted butter? Sharp cheddar? Either butter is fine, there’s plenty of salt in the cheese to compensate! I typically use a sharp cheddar, but have also made this with medium cheddar. Hope this helps! Hi! Has anyone tried making this ahead of time and then keeping on the “warm” setting for a few hours. We have to travel for the holidays and would love to make before our hour travel and keep on warm. Thanks! I think that would work fine, it might get a bit drier because the pasta will continue to absorb the sauce, so you could always stir in a bit more milk to thin the sauce before serving. Hope that helps! Do you think it would come out ok if I prepped ahead & then cooked 3-4 hrs later? I haven’t tried it this way, I think it would work but the pasta may absorb some of the liquid when it’s sitting for 3 hours, so maybe try undercooking the pasta a bit, and if the mac and cheese mixture looks dry when you’re cooking it, add a little more liquid about 1 tablespoon at a time until you get to your desired consistency. Looks delicious! Do you think the taste and consistency would work if it sat in the crock pot for an extra hour or two on the “keep warm” setting? Thanks! could this be done on top of the stove on simmer? I made this for a 4th of July party and it was a hit! I got a lot of compliments and many of my guests asked for the recipe. I was disappointed there weren’t any leftovers! It was delicious and very easy to make. This will definitely be in my dinner rotation. Thanks for a great recipe! Can you make this on s stovetop? Yes you can, you’ll just want to add less liquid since it won’t cook as long, it won’t absorb all the milk that the original recipe calls for! Sounds like a lovely mac and cheese recipe! I would love to give it a try and I love that fact that it’s a slow cooker recipe, which means you can simply leave it to cook! Super convenient! 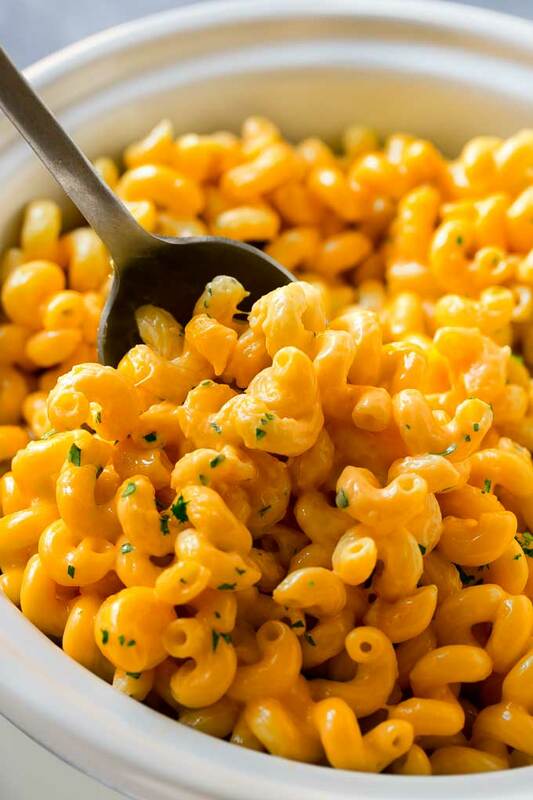 Your mac and cheese looks perfect! It has been like two weeks since we had mac and cheese so thanks for the motivation! I will make some tomorrow. My husband and my sons will have happy tummies! Mac and cheese is my children’s favorite dish ever! I have to try this slow cooker recipe!